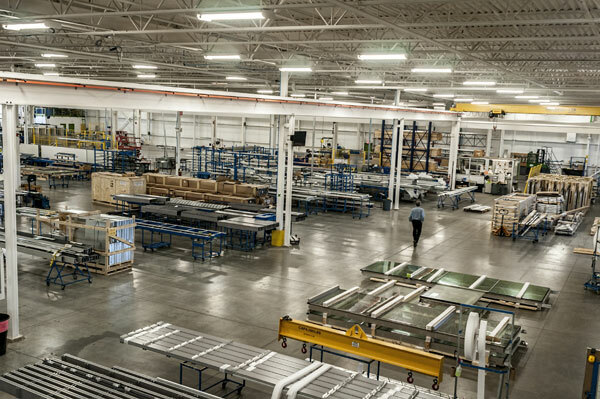 It’s an exciting year in the world of manufacturing. With the Internet of Things (IoT) becoming increasingly pervasive and innovations and new technologies paving the way for more efficient, productive, and intelligent industrial operations, manufacturers have the opportunity to continue with the forward momentum the industry experienced in 2014. The new year brings challenges such as talent acquisition and skills training as Baby Boomers consider retirement and younger workers look to fill the hundreds of thousands of positions left open in their wake. How will manufacturers respond to shifting workforce demographics while maintaining the industry’s upward trajectory? Chris Glenn, Vice President of Manufacturing and Engineering Operations, Hytrol. As Vice President of Manufacturing and Engineering Operations, Chris Glenn is responsible for Hytrol’s Technology Center, all manufacturing and logistics operations, as well as the engineering department. His primary focus is on the tactical and long-term strategic initiatives as they relate to manufacturing and engineering within the company. Glenn has been with Hytrol Conveyor Co., Inc. for over seven years and brings more than 20 years of experience in the manufacturing field to his position. Milt Tandy – Director of Sales & Marketing for both WireCrafters LLC and StrongHold Products. Brian C. Neuwirth is the Vice President of Sales and Marketing for UNEX Manufacturing, a manufacturer of customized material handling and order picking solutions. Matthew Bush is the Director of Operations at SFEG in Fairview, TN. He has been in operations for over 15 years primarily in High Mix, Low Volume operations, is a Master Black Belt in Six Sigma with a BSME and MBA from the University of Florida and a MA in Industrial Technology form the University of Northern Iowa. “Every year, Cognex sales engineers work with thousands of manufacturing professionals to determine major trends for the year ahead. There are many trends to watch for 2015 (faster production lines, logistics and supply chain improvement, traceability of more products and components, and higher product quality standards), but one of the more prominent trends is increased robotics and automation. Advances in 3D machine vision and robot technology will make many manufacturers take a fresh look at adding more automation to production lines. John Lewis is Market Development Manager at Cognex. He’s been with Cognex for 11 years and was formerly a technical editor for an engineering magazine. He’s been writing about machine vision, factory automation and other technology topics since 1996. He’s published hundreds of articles in dozens of trade journals and holds a B.S. degree in chemical engineering from the University of Massachusetts, Lowell. Charles Fallon, Principal at LIDD, is a supply chain consultant having served clients across North America for the past 16 years. He has worked with clients at all points in the supply chain, from manufacturers to retailers, primarily in the food, pharmaceutical and apparel industries. “As e-commerce spending continues to increase, manufacturers have to keep up with the growing pace of the industry. As a result, companies need to draw on better supply chain and dispensing technologies, especially during peak sales periods. SI Systems’ Dispen-SI-matic and Mobile-matic assist order picking applications while helping the e-commerce industry quickly deliver products and compete against other companies and with customer demands. Mary Denvir, SI Systems’ Director of Marketing, received a BA from the University of Notre Dame and a ME from the University of Miami, FL and has been in marketing for over 15 years. Adam Robinson is the marketing manager for Cerasis, a third party logistics company offering a web based transportation management system and managed transportation solutions for shippers who primarily ship motor freight (LTL, Full Truckload, Small Package) in North America. Martijn Graat, Founder of @LogisticsMatter and LogisticsMatter.com, an independent news aggregator and blog on Logistics and Supply Chain. “American manufacturing is making a comeback. ThomasNet’s latest Industry Market Barometer research shows that companies are growing, hiring, and investing back into their businesses to capitalize on what’s ahead. But, for the industry to survive, all the fundamentals must be in place, and one critical piece is missing—a robust pipeline of workers. Kristin Carty, Audience Outreach Director, is passionate about helping engineers and purchasing professionals to work more successfully by using the free resources on ThomasNet.com. She travels around the country to meet with engineering students at colleges and universities; corporate purchasing departments; and members of purchasing and engineering associations. She especially enjoys helping those individuals who are just beginning their careers to rely on ThomasNet.com throughout their professional lives. Before joining ThomasNet.com in 2012, Kristin held several sales positions at McGraw-Hill, most recently as a New Business Campaign Manager. Kristin earned a bachelor’s degree in Business, with a concentration in Marketing and Management, from Monmouth University. She is now pursuing a master’s degree in Business with a Finance concentration, also from Monmouth. In addition, she is a Six Sigma Green Belt and an enthusiastic proponent of lean methodologies. Manufacturers across all industries are predicting exciting changes ahead, including lean operations, improved automation, technology & innovation, safety & security, and more. What manufacturing trends is your organization predicting for 2015? How can you adapt to the coming years of fast growth and change?